For me, cleansing balms are a little bit of luxury in my daily routine. The simple pleasure of massaging a rich balm into my skin and wiping away the day is delightful to me. I have tried several natural and organic cleansing balms over the two years of writing this blog and have never been disappointed. I am going to jump straight in and declare this Inlight Organic Face Cleanser as a gorgeous product. It is balm with a soft buttery texture which melts easily and glides across skin. You need the smallest pea size amount of this product. If I apply any more, I find I have to put effort into removing, it does no harm but I can feel as if residue is left on my skin. I find a simple wipe with toner rectifies any heavy handedness. 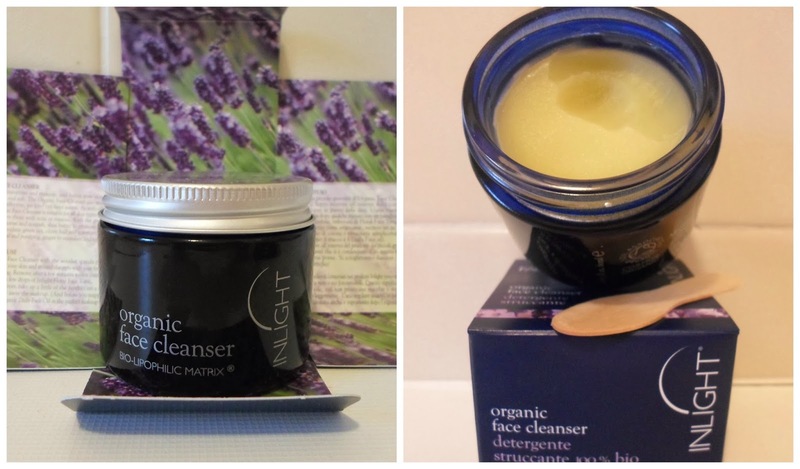 Inlight Cleansing Balm is packed full of lovely 100% organic natural ingredients. In this product there is coconut oil, shea butter, jojoba, rosehip, lavender, evening primrose and many more (full list is available on the website). It is not suitable for Vegans as it does contain beeswax. The fragrance may not be to everyone’s taste as I would describe it as aromatic and spicy. I feel as if clove and ginger are the distinctive notes and I find the fragrance very enjoyable. Packaging is not important to everyone but I do feel as if the box needs to be mentioned. Printed inside the box are the product introductions and it does make a change from the folded up pieces of paper you often find wedged at the bottom. The blue glass jar is elegant and heavy which adds an air of luxury. I honestly do not see any flaws with this product. It compares well with Suti, Lulu & Boo and 100% Organics. I will happily add this to the growing list of cleansing balms which I recommend trying. Have you tried this or any other products from Inlight? This sounds lovely, I like using cleansing balms and the spicy element would be perfect for using in winter. I haven't heard of this brand but it sounds lovely! I tried organic surge anywhere balm but I found it to be a bit gritty but the way you've described this as a soft butter feel just sounds lovely!